The Cross Country flights in this book are designed to be easy enough for novice pilots to fly, while offering the opportunity to more experienced pilots to get their palms a little sweaty. Even though this flight is planned for clear and calm conditions, it is probably the most challenging flight yet in the book. The reason it’s so difficult is that you’ll be flying by a combination of visual and radio navigation, but it’s what you can’t see that can hurt you on this trip. For this flight, you’ll be traveling from El Monte to Riverside Airport—just a short 30 nautical miles to the east. As you discovered in the last flight in this area, the LA basin is a patchwork quilt of special-use airspace, with Class B and C areas towering over pillars of Class D space, forming a maze of obstacles for a small plane trying to navigate without entering airspace that requires contact with Air Traffic Control—so I plan these flights to keep you clear of those areas so that you don’t bust special airspace regulations. A look at the Los Angeles sectional shows that the Class C airspace over Ontario International sits right in the way of a direct route from El Monte to Riverside. 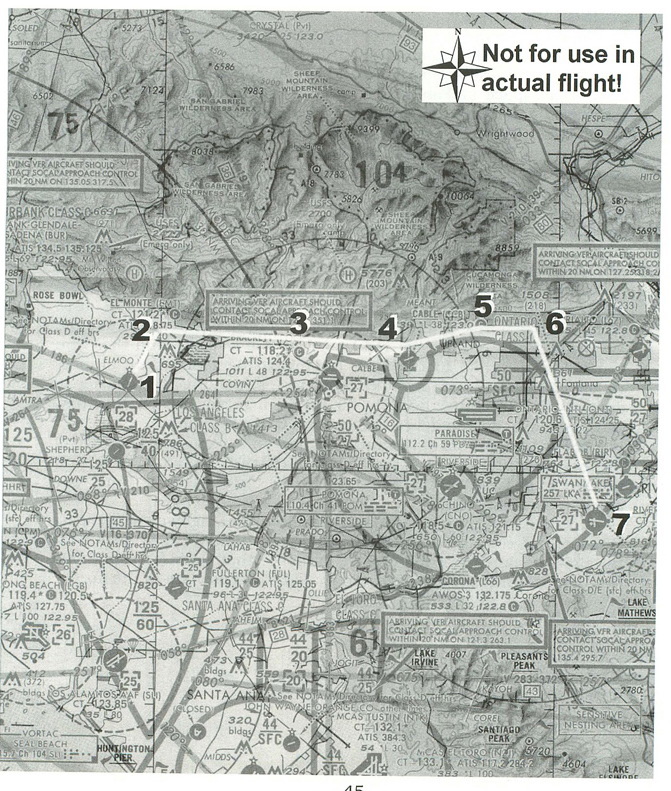 (The information on the sectional is very dense; for a better look at it, you might want to get a Los Angeles VFR Terminal Area Chart that uses a scale twice as large as the sectional.) To the south of this, there is a hunk of Class D airspace over Chino airport, and if you go further south, there are the combined Class C spaces over John Wayne Airport and the military El Toro base. It clearly gets hairy if you try to take a southern detour. The shading represents mountains, and they rise up rapidly from the floor of the LA basin. Elevations rise from 296 at El Monte and 943 at Ontario to peaks above 4,000 feet just a couple of miles north of the edge of the Ontario airspace. All you have to do is keep those mountains at a safe distance to your left as you fly eastward along their edge, then you can turn southeast to Riverside once you have cleared the edge of the Class C space. Now here’s the catch; you won’t be able to see the mountains because you’re going to make this flight at night. (If this seems like too much of a challenge to start with, fly it in the daytime once or twice, and then see if you can do it at night.) The mountains are big, brown monsters in the daylight, but at night, the lack of houses and roads on their steep surfaces make them darker than the starlit sky. So you’ll have to be careful not to hit what you can’t see as you fly at night. The flight log that I have prepared for your trip lists the key points along your route. The main trick on this flight will be to stay under or outside the Ontario airspace. You’ll also have to either go around the Class D airspace at Pomona, or over it. There’s only a little space between the dotted circle and the dark bad stuff, so we’ll plan to fly over it. Note the “27” in a broken box inside the dotted circle around Pomona; this indicates that the Class D airspace ends at 2,700 feet, so we’ll plan to climb to 2,800 feet before you get there. In the rectangular section east of Ontario, the Class C space is marked with a fraction: 50 over 27. This means that the special use airspace extends from 2,700 feet up to 5,000 feet. Since Riverside is just under the southeastern curved portion of this space, you’ll have to be down to about 2,500 feet by the time you get to this point. So now we know what altitude you’ll fly at (more or less), but what about headings? Well, since you’ll be departing from Runway 1 at El Monte, you can just fly the runway heading until you reach Interstate 210 (which is the east-west road north of the airport), and then you can follow the road to the east. (At night, the roads have orange-yellow lights as if from sodium-vapor lamps, making them easier to distinguish from house lights in the FS 5.1 night landscape.) But how can you tell when you get to the Pomona Class D airspace? One way to do this is use the VOR beacon at Pomona. The edge of the airspace intersects I-210 along the 115º radial, so to be safe, you need to be at 2,800 feet by the time the VOR is about 110º from your position over the road. It would be great if you could follow the highway right past Ontario, but soon after it turns into Foothill Boulevard, it goes right through the portion of the Class C airspace that extends from 5,000 feet right down to ground level. So you’ll have to deviate to the north. Again, the VOR can help you with this; before you reach Pomona, head about a mile north of I-210, and set the NAV radio OBS to a 50º setting. Fly along north of the highway until the needle centers, and then fly out along the radial. As long as you stay to the left of the highway and on or to the left of this radial, you’ll stay clear of the Class C airspace. You can’t fly this heading forever without climbing or you’ll hit something solid, however. If you use your other NAV radio to track the Riverside VOR, you can fly out along the 50º radial from Pomona until it intersects the 130º radial toward the Riverside VOR. This will place you halfway between the mountains and the Ontario airspace, and you can turn east to a heading of about 75º to remain clear of them both. Finally, when you reach the 145º radial for the Riverside VOR, you can follow it down to the airport; remember to start to descend to 2,500 feet when you make your turn. This route will keep you clear of the Class C airspace to the west and the little bump of rocks to the east (it has a peak at 2,217 feet). Keep on descending until you reach the Riverside pattern altitude of 1,816 feet. Once you have the airport in sight, enter a left downwind leg for Runway 9. The tower closes at 8 o’clock at night, so you can use the CTAF frequency of 121.0 to announce your intentions. You’ll have 5,400 feet of runway to work with, so don’t be too worried about planting the gear right on the numbers. Remember that everything looks different at night, including how a runway looks on final, so take your time and be sure to set up a nice, stable approach. This will put you right at the number for Runway 1 at El Monte. In the World menu, set the time of day to 20 hours 00 minutes local time; that’s 8:00 o’clock at night. You may want to turn on your landing light at this point; press L to turn it on. Next, tune your NAV radios. Set NAV1 to 110.4, which is the Pomona VOR. Set the OBS to 110º initially; remember that you want to be at 2,800 feet and about a mile north of the highway before the needle centers. After it does center, you’ll want to reset the OBS to 50º; this is the radial that you’ll follow to stay northwest of the Ontario Class C airspace. Then set your NAV2 radio to 112.4, which is the Riverside VOR. Adjust the OBS to 130º for the initial setting; when you’re following the 50º radial for the Pomona VOR, you’ll want to come right to a heading of 75º when the needle centers for the Riverside VOR 130º radial. After you have made your course change, readjust the OBS on NAV2 for the 145º radial. When it centers, turn to follow it right to the Riverside Airport. Make sure that your transponder is set to 1200, the VFR squawk code. Once you reach your initial altitude of 2,800 feet, throttle back to a 130 to 135 knot cruise. Remember to start your descent about the time you turn to a 75º heading after intercepting the Riverside VOR 130º radial, but don’t descend below 1800 feet. It’s a clear night for flying, and you’ll be able to see the Riverside Airport from miles away. If for some reason you should lose sight of the airport as you follow the 145º radial to it, keep in mind that the only reason would be that something has come between you and the field—like perhaps that “little bump of rocks” mentioned earlier. Remember—when flying at night, it’s what you can’t see that can cause you the most trouble.